I have a thing for mail. Post. Correo. Whatever you call it, I love it. I embraced the internet shopping phenomenon because it meant getting packages in the mail. I seriously get a rush when I see the mail truck or UPS truck pull up. I keep stamps and extra postcards in my notebook. Weird? Possibly. Probably. When I was younger I had over thirty pen-pals from all over the world. I spent exorbitant amounts of money on postage, and always waited eagerly for the next missive from Norway, the Czech Republic, Madagascar or whatever other corner of the world I’d been writing to. We’d exchange elaborate ‘friendship books’ with addresses from all over. I adored my pen-pals, though I think I must have been a very boring correspondent. I eventually gave them up right before college – after all, I was off on a grand adventure (real life!). Anyway, back to Mr. Jolly P. I believe that this book, along with another favorite, A Christmas Card for Mr. McFizz, were the beginnings of my obsession with correspondence. I’m a letter-writer, and more recently a postcard-sender. I have stacks of stationery because I actually use it. Of course, these early reading experiences with the epistolary style were shaped by other encounters with letter-type literature as I grew older. The Screwtape Letters made its mark at age 14, and all of Austen’s novels contain letters. The Diary of Anne Frank is a sort of series of letters. But letters in literature aren’t QUITE as awesome as letters or mail in fact. This British import is great fun, sure to entertain children and parents alike. 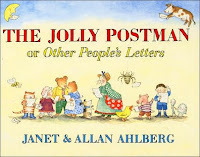 The Jolly Postman goes from home to home in a fairy-tale kingdom, delivering letters to such familiar addresses as "Mr. and Mrs. Bear, Three Bears Cottage, The Woods." Every other page is an actual envelope, with a letter tucked inside. The letter to the three bears, for instance, is from Goldilocks, who apologizes for the trouble she's caused and invites Baby Bear to her birthday party. Recommended for: picture book lovers, kids, kids-at-heart, and other (fellow) post fanatics. Are you out there? you always took the envelopes! Fun idea. I love it. I've never seen these books but they sound like great books for me to pick up for my great nieces and nephews. I used to write so many letters and I loved getting them too. Sorta sad that e-mail has taken that all away. Thank you so much for bringing up a beloved children's book! I own the Christmas and Other Letters books and loved the interactivity. I too developed a love of letters from books like these but I didn't have your luck with penpals. 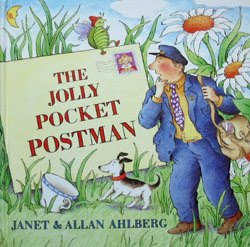 OMG I loved these, I bought a Jolly Postman book for my son (now 18) when he was little and I swear I loved it as much as he did. Thanks for the trip down memory lane! I've been carrying on my mother's tradition of giving my Grchildren a christmas book every year. 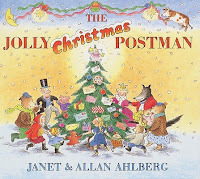 I have a copy of this Jolly Christmas Postman at my house to read to them when they come over. It's a favorite. They are just getting old enough to "get it". I'm sure you have read "Daddy Long Legs" by Jean Webster. If not, DO! I adore these books! My mother-in-law is a teacher and this summer she introduced me to her copies, which I loved. Yesterday I opened my Christmas present from her (early, how naughty of me!) and tucked inside was my very own copy! i love these. and i love mail too. sweet post.